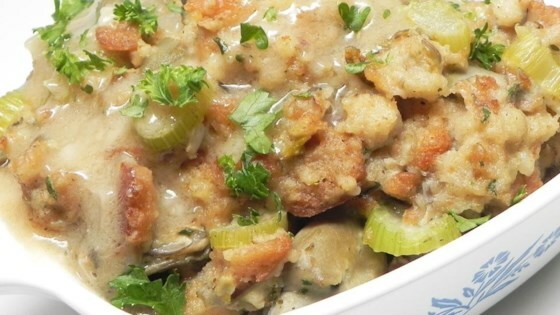 "This quick and delicious oyster dressing takes the fuss and the mess out of the picture. It is all done on the stove top, and tastes like it has been cooking in the oven all day!" Melt butter in a small skillet over medium heat, and cook and stir the celery until tender, about 10 minutes. Stir in sage and poultry seasoning. Remove from heat. Mix chicken broth with water in a large saucepan, and bring to a simmer over medium heat; stir in the margarine until melted. Lightly stir the cornbread stuffing mix into the broth mixture until the broth has absorbed; fluff the stuffing mix with a fork. Mix in enough oyster liquid to moisten the dressing, about 1/2 cup, or as desired. Gently stir in the celery with butter and seasonings from skillet, oysters, and black pepper. Cook the dressing until hot and the flavors have blended, about 5 minutes.